Make the bolognese sauce and set aside. To make the white sauce, place the butter in a saucepan over medium heat and allow to melt. Add the flour and stir to a smooth paste. Whisk in the milk and then stir until the sauce has boiled and thickened. Stir in the parmesan and add the salt and pepper. Set aside to cool to room temperature. Preheat the oven to 190°C (375°F). 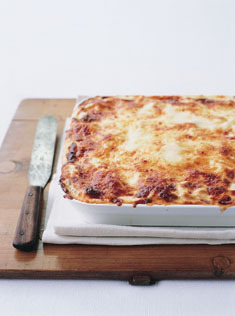 Grease a 20 cm (8 in) x 20 cm (8 in) square ovenproof dish and line with some of the lasagne sheets. Thinly spread over quarter of the basic bolognese sauce, cover with more lasagne sheets, then spoon over quarter of the white sauce. Repeat the layers, finishing with the white sauce. Sprinkle with the mozzarella and bake for 25–30 minutes or until golden brown and cooked. Serve with a simple salad. Serves 4. Love this dish, bonus is that it can warmed and enjoyed the next day if you make too much! I don’t always have Mozzarella, but have substituted tasty grated cheddar successfully.